When they first came onto the scene, the Cars straddled the line between musical styles. As Brett Milano wrote in his liner notes for the 1995 band compilation Just What I Needed: “Most rock fans were split into two camps, with hardly any common ground. Either you listened to ‘punk’ bands like the Clash, Talking Heads, or the Cars, or you were into ‘mainstream’ bands like Aerosmith, Queen or the Cars.” Thus, it’s kind of hard to pigeonhole these Boston-based legends, which is probably why their music today sounds timeless and relevant. Prior to the group’s 2011 reunion album Move Like This, the Cars released six quality records—including some bonafide classics–which are now collected in this boxed set, making an convincing argument for their belated induction into the Rock and Roll Hall of Fame. One of the outstanding debut albums in rock, the 1978 self-titled record could really be considered the Cars’ Greatest Hits because nearly every track from it has since become a staple on classic rock radio: “My Best Friend’s Girl,” “Good Times Roll,” “Just What I Needed,” “Moving in Stereo,” and “You’re All I’ve Got Tonight.” Had the Cars never released another record in their career, this debut would have already assured their legacy. It was the record that introduced to the world the twin vocal leads of guitarist Ric Ocasek and bassist Benjamin Orr; the dazzling, quirky Eno-esque keyboard sounds of Greg Hawkes; the bombastic drumming of David Robinson, and the spiraling and cutting guitar of Elliott Easton—not to mention Ocasek’s romantic-ironic songwriting. Producer Roy Thomas Baker (Queen, Foreigner) was the perfect choice to realize the band’s sleek and direct rock sound, which he would do over the band’s next three records. The 1979 sequel Candy-O picks up where The Cars left off with a number of killer cuts including “Let’s Go,” “It’s All I Can Do,” and an underrated gem titled “Dangerous Type.” The album also reveals the band’s avant-garde side with “Shoo Be Doo,” a very dark-sounding track in the vein of New York punk act Suicide, whom Ocasek would later collaborate with. Yet there were signs of the Cars going through the motions by the time they recorded what turned out to be their swan-song, 1987’s Door to Door. The verve and punch evident on their previous records weren’t there on Door to Door, although there were a few sparks in “You Are the Girl,” and “Coming Up You,” “Strap Me In,” and the very punk-ish title song; still even at its weakest, Door to Door is better compared to other groups’ less-than stellar efforts. 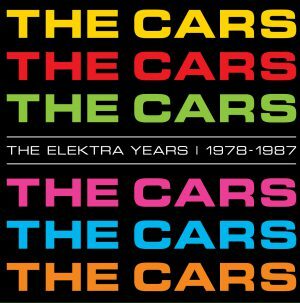 For those who perhaps own only one Cars album or a greatest hits compilation, The Elektra Years—which features the records in vinyl replica packaging, and the original white border on the cover of Heartbeat City—is perfect way to have the hit songs and key album tracks the group recorded in just one set.